A nationwide sigh of relief could be heard across Canada on Oct. 1, as the NHL regular season began. Coinciding with the professionals, Oct. 4 marked the start of the Mount Royal Cougars season, when the men faced off against the University of Saskatchewan Huskies at Flames Community Arenas. The men’s squad went a disappointing 7-19-2 last season, however according to the Cougar Athletics website that was not indicative of their play. Lead by veteran coach Jean Laforest and two new assistant coaches Bobby Fox and Ben McGinn, the Cougars look to improve in a very competitive CIS West division. The Cougs’ are returning key veteran forwards Captain Kevin Knopp, Eric Galbraith, Mike Brown and Tyler Jewitt to their roster, and are hoping they provide leadership. Galbraith, the men’s top point-getter and goal-scorer, was second in the CIS for goals in 2012-2013 — finding the net 16 times in 26 games. Jewitt also had a solid season finishing right behind Galbraith in the point race. The Cougars have added depth with the addition of forward Tyler Fiddler, who comes to MRU via transfer from the University of Calgary. Fiddler, who played just 16 games last season, was able to score 10 times finishing in the top 20 in the league. Two NCAA players have also made the trek up north to join the Cougars this year; Cody Cartier and Kris Moore hope they can provide some more firepower to an eager Cougars squad. The men were able to beat the University of Calgary at the Saddledome last year in the inaugural, record-breaking showdown at the Crowchild Classic — which will take place again this year. The womens’ squad also began their season on Oct.4 against the University of Saskatchewan Huskies on the road in Saskatoon. The women’s team had an interesting first season in the CIS West, as they sat in a playoff spot for most of the season — but were derailed by a late losing streak. According to the Cougars’ Athletics website, head Coach Scott Rivet has built his team for speed and is determined that the girls will be able to produce if they focus on solid skating and abide by the fundamentals of hockey. 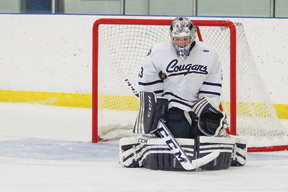 The Cougars womens’ hockey program was dealt a blow this year with the departure of four-time MVP and leader Chrissy Hodgson, meaning returning veteran forwards Tanika Dawson, Emily Harrison and Taralynn Suzuki will have to step up and take charge this year. Dawson was tied for the team lead last year with 22 points in 28 games, while Harrison and Suzuki managed 18 and 10 points respectfully. The women hope to rebound this year from their setback at the ‘dome, when they lost 2-5, and take the Crowchild Classic medal back to Mount Royal in 2014. Next story The candidates of Ward 11: Who will you choose?